Observed emerging in mass at dusk from a termite-riddled stump. The alates appeared to all be female. Kakamega Forest, Kenya. Oct. 2016. 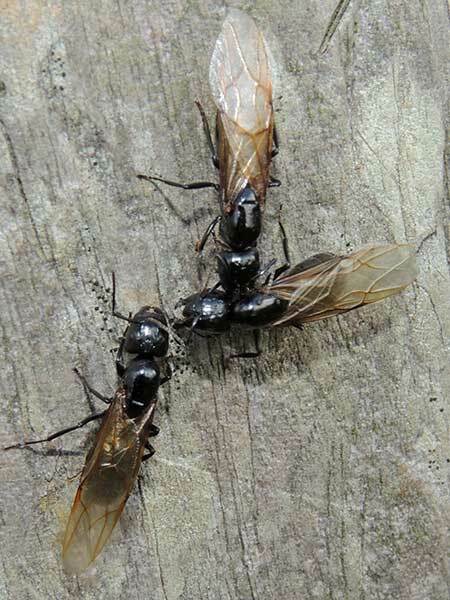 Just as dusk was approaching this colony of carpenter ants began releasing alates (winged). These are the reproductive cast - the production of which the whole colony is always geared towards. All the wingless ants you see crawling about are sterile females. These alates are heavy with stored fat and they lack a sting or acid defense. As such they are a prized food of birds and most insectivores. 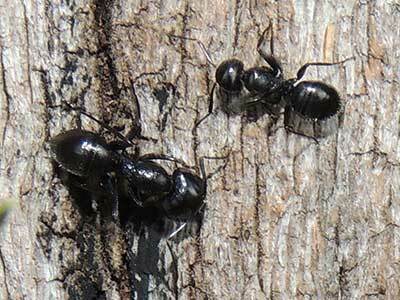 Masses of soldier-like majors (in the photo above the lower left ant is a major) emerge with them for protection. These future queens must fly off though and face a barrage of birds and bats. Indeed I saw swallows, shrikes, bulbuls and bee-eaters feasting. So many fat queens emerge at once that these predators soon become sated and some of the flying ants get through to find a place to attempt foundation a new colony. Copyright Michael J. Plagens, Page created 10 April 2017.